I LOVE ham and pea soup! It is such a satisfying soup that hits all flavor receptors as well as hunger pangs. This soup is NOT vegetarian or vegan. However, you could use the basic recipe and substitute vegetable stock/bouillon for chicken stock/bouillon and of course leave out the ham. I have found that blending a soft silky tofu with the stock, will give a “creamy” texture and flavor, not to mention adding in more protein. Add a few drops of liquid smoke for a vegetarian “hammy” flavor! I typically make stocks, soups and tomato sauces on the weekends, as the longer you can let ingredients simmer, the more flavor is extracted leading to a complex flavor profile for the end product. This recipe is assuming you have hours to make it. If you do not have hours, then you can take short cuts and still end up with a flavorable soup. First thing – I do not use dried peas, ie: split peas. I use fresh or frozen peas and fresh herbs. I think the fresh ingredients provides a brighter flavor. If you make a large batch, this will freeze well. I thank my neighbor who provided the ham bone from another dinner we had the last weekend. This recipe is thanks to him for providing the inspiration. Cut off the larger pieces of ham from the bone (reserve and dice for later use). The bone does not have to be picked clean by any means, in fact, leaving ham on the bone is good as more flavor is released into the stock. In a 6 – 8 qt stock pot, add 1 – 2 TBS olive oil. Heat over med to med-high heat. Add onions, carrots, black pepper, celery, fresh herb sprigs, bay leaf, ginger and saute until the ingredients begin to brown/caramelize. Add in better-than-bouillon chicken/vegetable (or two cans stock), and stir to combine. Add in ham bone (if using) and enough water to cover ham bone. Stir to combine, then let simmer for 3-4 hours, or until meat falls from the bone and all flavoring from the bone has been released into the stock. – If not using then add a total of 8 cups of liquid (combination of water and vegetable stock). Once stock has simmered and reduced by 1/3, strain liquid into a bowl, and mash chunks through a fine mesh sieve to extract all liquid and pulp. Discard all that did not fit through the sieve. In a large saute pan, add 1 TBS butter until melted, then add in leeks, peas, herbs, pinch of salt and pepper and saute until leeks are just soft. Return the stock/liquid to the pot over med-high heat. Add in the peas and leeks mixture. Let simmer for about 20 minutes (reduce liquid by 1/4). Taste and adjust seasoning (hold off on salt until the end as the ham will add salt). In batches with blender, food processor or using an emersion blender, blend all ingredients until smooth (if using tofu – add here). Return the liquid to the pot and add in the ham cubes (if using) or liquid smoke and simmer another 5 minutes. Add in the cream. Stir and let simmer an extra 3 minutes. Taste and adjust seasoning (salt/pepper) if needed. Other options: add about 1/2 cup parmesan cheese or goat cheese for the creamy texture – just watch more salt, as parmesan cheese is salty. Enjoy! I will be enjoying it with my son for a while as I did freeze a few batches. 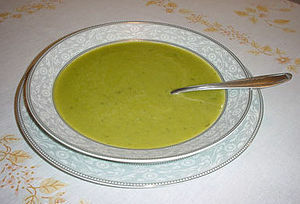 Posted by culinaryease on May 8, 2011 in Cooking for two or less, General Cooking, Recipes, Vegan/Vegetarian and tagged Cream sauce, Hambone, Pea soup, Peas, PostaWeek2011, Soup.